Today, I replaced (almost) all projection images of the physical map with shaded relief ocean floor type with new versions. 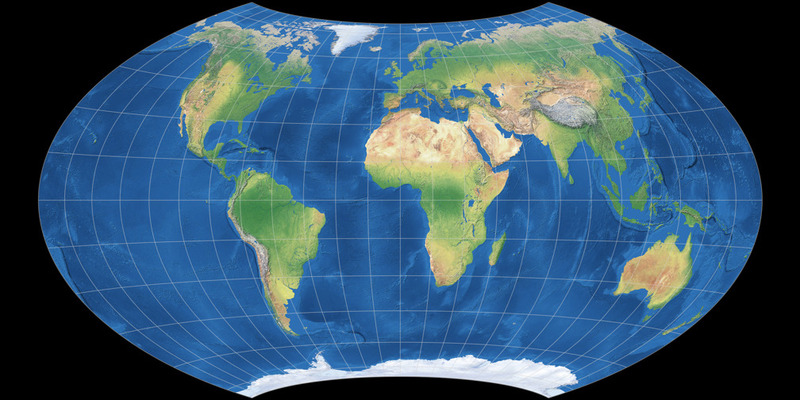 Update: All projection images showing physical maps have been replaced by new versions. Why did I do that, and how do the new versions differ from their predecessor? When I started map-projections.net at the beginning of 2015, I just grabbed one of the Natural Earth II images from shadedrelief.com and modified it: I darkened the colors (the bright original colors are great if you like to put text labels on your map, however a bit pale if you want a map without labels); and I sharpened the image. Well, I’m not graphic designer, and so I did a common rookie mistake: I oversharpened it. Worse, when I added the projections images showing the ocean with flat blue tint at the end of 2015, I repeated that mistake. For quite a while, I didn’t even notice – but at some point, I did. And then, that flaw leaped into my eye painfully each and every time I saw the images. I started thinking about replacing the images months ago. But boy, that is some kind of work! I had to replace images for nearly 200 projections, each of them once in the relief and once in the flat variant. And to regenerate nearly 400 projections images is a very tedious and tiresome work. (Fortunately, I can generate the »scaled to same width« variants using batch processing.) So I postponed that task time and again. But now I assailed the task, starting with the relief ocean floor images. The flat ocean images will follow soon! The new projection images I added today – see this blog post – already use the new, less sharpened image. Yes, the old version had more details – eye the Atlantic bottom, or the Amazon River – but really, it’s just too sharp, don’t you think? You’ll get to the License information. Scroll down to the bottom of that page, and right above the footer you’ll see a link called »Show old version of [projection name]«. Use this to view/download the image. If the said link is not to be found, the projection in question was probably added after I’ve switched to the new versions, so there’s no old version available. Starting with the update of Sep 18, 2017, new projection images will not be uploaded using the old version. The old images will remain on the server at least until the end of 2017. After that, I might remove them at any time without prior announcement. So if you want to save some of the old images, grab them now. And, oh … at the top of this blog post, I said I replaced almost all projection images. 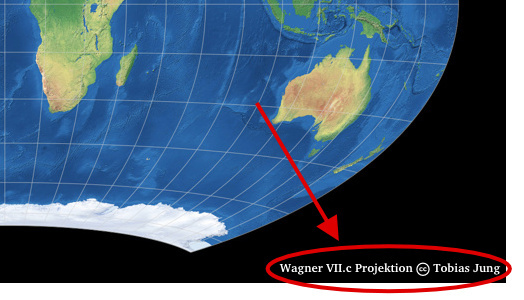 For some reason, generating an image of the Kavraisky I projection doesn’t work anymore on my system. So here, the old image will have to do.